If he had lived, he would have crucified them all! 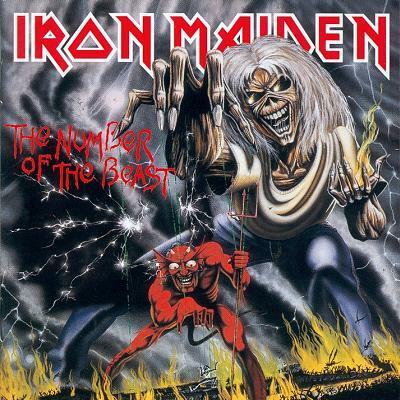 Iron Maiden's third studio album Number of the Beast is truly a beast. Each song is hit after hit of classic metal. The songs are powerful, operatic, lyrically skillful, varied, and at times blinding. Definitely a clasic of the metal genre. Starting off with the scale play of Invaders, leading into the seeming Black Sabbath inspired Children of the Damned. The lyrics depict (intelligently) battles and mystic powers, devils and war. The prisoner is melodic and strong. The soloing on this album is flashy and fantastic. 22 Acacia avenue is a mutli-part continuation of the Harlot series, and has some exciting parts. The title track is blistering. The solo is violent and furious. Then you have the catchiest song on the album, Run to the Hills. It tells of the plight of the Indians, and is quite good. With another raging solo. Gangland is the only filler, here. And, it is good filler. But keeps This from becoming the ultimate metal masterpiece it should have been. Total eclipse is good. And then you have the final track Hallowed be Thy Name... Wow. This is one of the best metal songs I have ever heard. The soloing is outrageous, the melodies are brilliant, the lyrics are enjoyable, and it is a monster of a track. It is a beast. A fitting end to one of metal's finest moments. But, this album isn't very progressive. So, I can only give it 4 stars.